A new anti-casinos group that includes greyhound advocates, mothers against gambling and conservative Christian organizations declared Wednesday that ''Miami is not for sale'' as it announced plans to fight the Jan. 29 slot machine referendum. Miami-Dade County voters will decide at the end of the month whether to allow the county's horse track, dog track and jai-alai fronton to install Class III, Las Vegas-style slot machines like those already operating at parimutuel facilities in Broward County. With only 20 days left before the election, organizers acknowledged at a news conference that they come in at a disadvantage. A pro-slots group organized months ago. ''It's our people against their money and muscle,'' said Tom Grey, field director of the National Coalition Against Gambling Expansion. Proponents of the referendum insisted Wednesday that slot machines will bring economic stimulus for local residents and pump millions into the local and state coffers through taxes. ''This referendum is bringing new opportunities through job creation, millions of dollars to local governments and over $200 million to the state education fund,'' said Christian Ulvert, press secretary for the pro-slots political committee, Yes for a Greater Miami-Dade. The new anti-casinos group includes representatives of the Florida Family Policy Council, the Christian Coalition of South Florida, Grey2K USA, Focus on the Family and the Animal Rights Foundation of Florida. Others attending included a University of Miami student, Chris Hill, and a Miami mother of five. Both said they are planning to organize groups to oppose the referendum. No Casinos Miami is not the same as a previous political committee, called No Casinos, that was created to fight earlier casino efforts, including a 2005 referendum when Broward County approved slot machines at parimutuels but Miami-Dade narrowly rejected the idea with 52 percent of the vote. If the referendum passes this time, it will allow slot machines at Calder Race Course, Flagler Dog Track and Sports Entertainment Center and Miami Jai-Alai. Slot machines already spin at three Broward ''racinos'' and a fourth casino has yet to be built. Adding heat to the debate: the announcement this week that the Seminole Tribe's gambling agreement with Gov. Charlie Crist has received federal approval, allowing the tribe to install Las Vegas-style slots and card games such as blackjack at its seven Florida casinos. The agreement is still being disputed in the Florida Supreme Court. Another group, United for Family Values, has previously announced its opposition to the referendum, and House Speaker Marco Rubio has promised to campaign against it as well. Chad Hills, a spokesman for Focus on the Family, said the new group opposes gambling because it adversely affects families. No Casinos Miami will hold an organizational meeting at 7:30 p.m. Thursday at the Residence Inn, 1212 NW 82nd Ave. The Florida Family Policy Council is grateful for the support we receive from people all over the state. We wanted to share a brief summary of what you have helped us to accomplish during 2007. 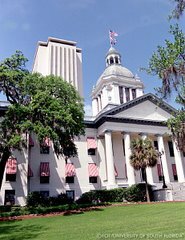 CLICK HERE to read about our work in the Florida legislature, news coverage we have received in the media and other accomplishments across the state.